Cobalt Digital announced the availability of its 9992‑ENC series of HEVC/H.265/MPEG-5 encoders for openGear frames. 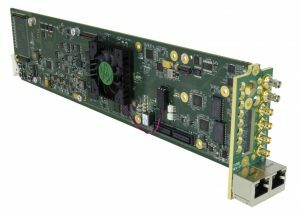 Designed for a variety of broadcast applications, the dual-slot card offers customized I/O options and extensive audio support for cost-effective contribution, distribution, ENG, IPTV, and OTT solutions. The 9992-ENC base model supports both MPEG-2 and H.265 (AVC), with low-latency 8-bit and 10-bit 4:2:0 encoding. For high-end contribution, optional license keys provide H.265 (HEVC) support as well as 4:2:2 encoding. The base model includes a 3G-SDI input that supports one signal up to 1080p60, but can be upgraded to support three additional 1080p60 signals for high-density workflows or one 4Kp60 signal (four 3G-SDI signals or one 12-SDI signal).